Even though my work week has been super busy and I’ve been stressed out about family stuff, I’m not nearly as sluggish, achy, and drained as I used to feel pre-Paleo. Yes, I get tired and a little cranky by the end of the week, but it’s more mental than physical fatigue. In fact, I always get comments from my co-workers that I seem so perky and energetic at the end of the night. Ha! I tell them that I’m just happy to be done with my shift – but secretly I know it’s because I’m eating clean. 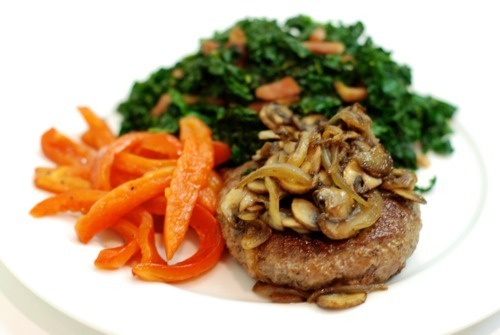 If you’re on the fence about going Paleo, just effing do it already! 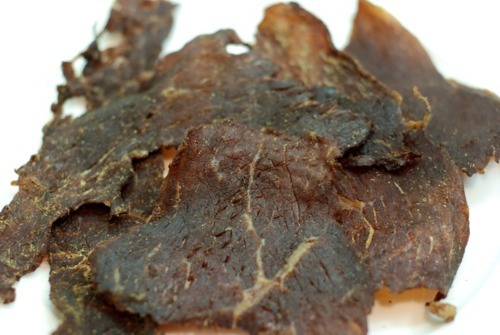 I was feeling the munchies at the stroke of midnight, so I snacked on some of the husband’s fabulous homemade beef jerky and a small container of dry-roasted almond slivers and coconut flakes. 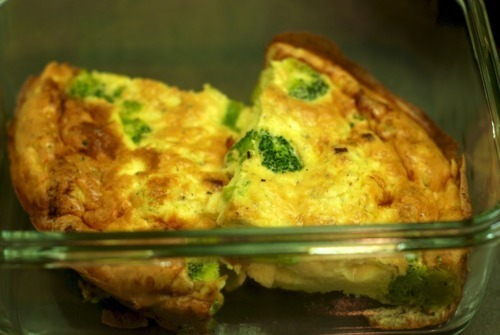 A couple hours later, I ate the second half of my broccoli and bacon frittata. 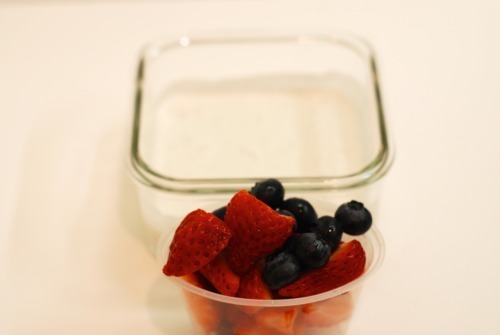 For my second snack of the night, I downed a container of coconut milk topped with strawberries and blueberries. The final meal I ate at work? 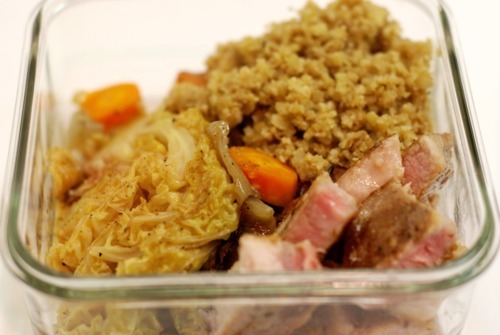 A box of leftover sous vide pork chops, cauliflower fried “rice,” and roasted carrots. Finally, my hellish week of work has come to an end! Don’t get me wrong: I really enjoy my job and I love working the night shift (I’m not kidding), but it feels freaking fantastic to have a week off. Back at home this morning after I marched Big-O to school, I mindlessly snacked on some macadamia nuts and coconut flakes while surfing the Internet. I crashed for a 4-hour nap before hauling the kids to Big-O’s kung fu class and Trader Joe’s to replenish our staples. Since I was sleep-deprived, I REALLY didn’t want to make dinner. My plan was to pick up a free-range rotisserie chicken at Calafia Market A-Go-Go and throw together a simple salad. Unfortunately, all the chickens were sold out within minutes. WTF? They start selling the chickens at 5:00 p.m., and every last one is gone by 5:08? I had no alternate plans for dinner. I was thisclose to grabbing some non-Paleo take-out, but instead I drove home determined to make something quick and yummy. I spent a few minutes frowning at the contents of my fridge and freezer before I spied a hidden treasure: frozen lamb burgers! 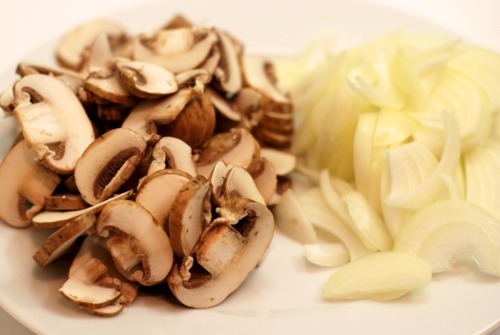 I decided to serve them topped with sauteed onions and mushrooms alongside some quick stir-fried lancinato kale and bacon and roasted bell peppers. 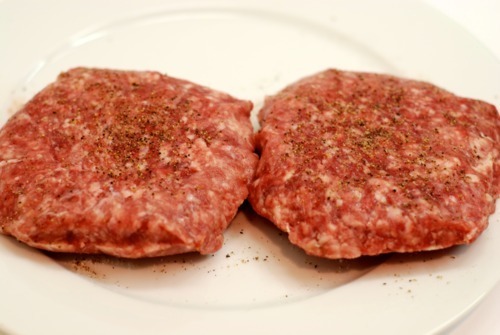 I carefully defrosted the burgers in the microwave and then generously seasoned the grass-fed meat cookies with salt and pepper. Next, I made like Martin Yan and chopped the ingredients for the stir-fried kale and bacon and the toppings for the burger. 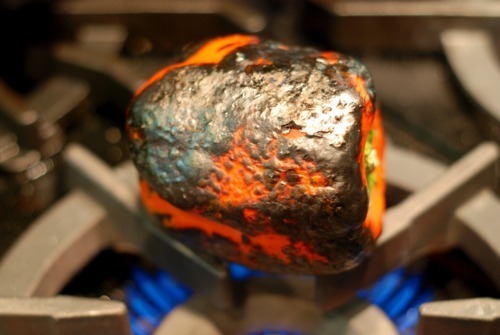 While I was washing and stabbing at the vegetables, I threw a bell pepper on the gas range and charred it. I chucked the blackened pepper in a bowl and covered it with plastic wrap to let it steam. 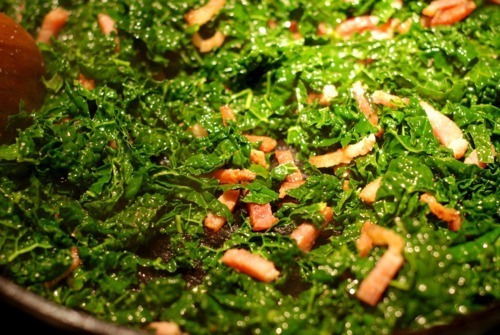 Meanwhile, I finished stir-frying the kale and bacon. No joke: This dish is done in less than 15 minutes, start to finish. Afterwards, I rinsed out the pan and melted some lard over medium high heat. Once the pan was hot, I added the lamb burgers and fried them for about 5 minutes on each side. When the internal temperature reached 145 F, I knew they were good to go. At the same time, I sauteed the onions and mushrooms (seasoned with salt and pepper) in my 8-inch cast iron skillet with some grass-fed butter. Once these burger toppings were done, I peeled, deseeded, and sliced the charred bell pepper and tossed it with some aged balsamic vinegar, extra virgin olive oil, salt, and pepper. Then, I plated everything up and we dug in. Dinner took just 45 minutes to make, and I went in blind. So when life throws you a curveball and your take-out dreams are dashed, just remember that you can do it, too.